The cameras are a very important aspect of the abundance survey the cruise is conducting. 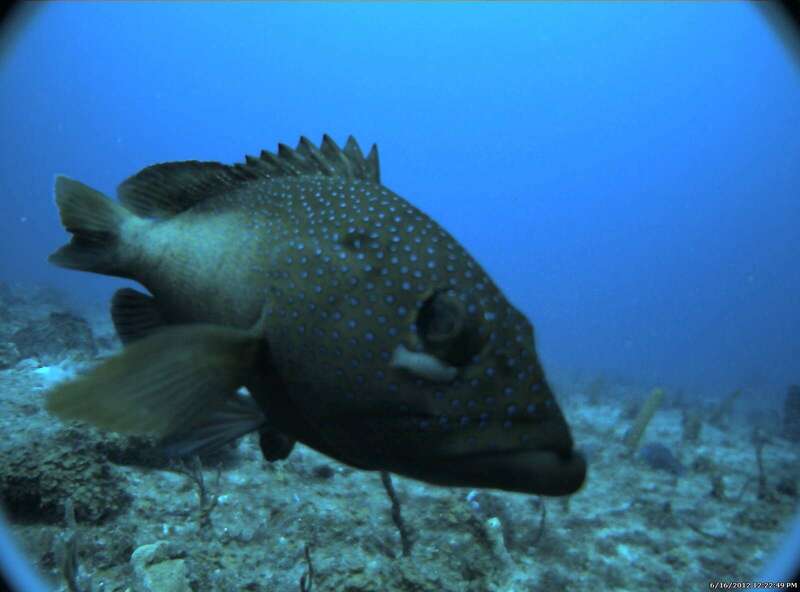 Since catching fish is an iffy prospect (you may catch some, you may not) the cameras are extremely important in determining the abundance and variety of reef fish. At every site sampled during daylight hours, we deploy the camera array. The cameras can only be utilized during the daytime because there are no lights – video relies on the ambient light filtering down from the surface. Camera array – the lens of one of the cameras is facing forward. Deployment of the array at a site begins once the Bridge verifies we are over the sampling site. The camera array is turned on and is raised over the rail of the ship and lowered to the water’s surface on a line from a winch that has a ‘quick release’ attached to the array. Once over the surface, a deck hand pulls on the line to the quick release allowing the array to free fall to the bottom of the ocean. Attached to the array is enough line with buoys attached. The buoys mark the array at the surface and give the deck hands something to aim for with the grappling hook when it is time for the array to be retrieved. 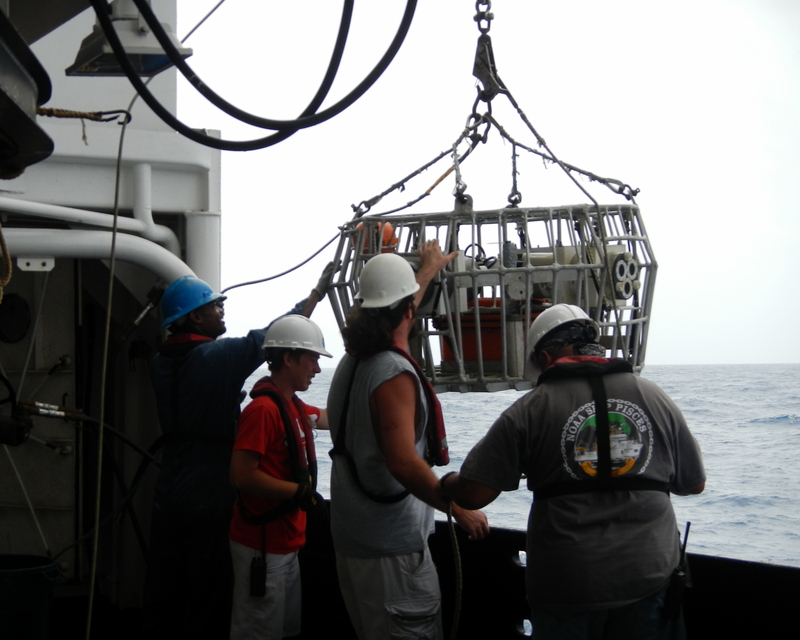 Once the buoys are on deck, a hydraulic pot hauler is used to raise the array from the sea floor to the side of the ship. From there, another winch is used to bring the array on board. Vic, Jordan, Joey, and Joe deploying the camera array. When the array is deployed, a scientist starts a computer program that collects the time, position and depth the array was dropped at. The array is allowed to “soak” on the bottom for about 38 minutes. The initial 3-5 minutes are for the cameras to power up and allow any sediment or debris on the bottom to settle after the array displaces it. The cameras are only actually recording for 25 of those minutes. The final 3-5 minutes are when the computers are powering down. At one point in time, the cameras on the array were actual video cameras sealed in waterproof, seawater-rated cases. With this system, after each deployment, every individual case had to be physically removed from the array, opened up, and the DV tape switched out. With the new system, there are a series of four digital cameras that communicate wirelessly with the computers inside the dry lab. We did have a short-lived problem with one of the digital cameras — it quit working and the electronics technician that takes care of the cameras, Kenny Wilkinson, took a couple of nights to trouble shoot and repair it. During this time period, we reverted back to the original standard video camera. 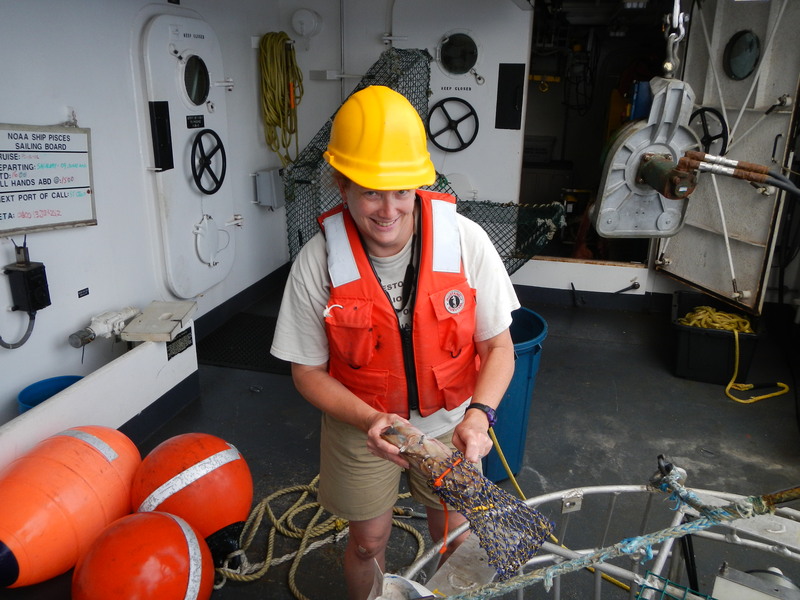 Throughout the cruise, Kenny uploads the videos taken during the day and repairs the cameras at night so they will be ready for the next day’s deployments. Besides the structure of the camera array which is designed to attract reef fish, the array is baited with squid. 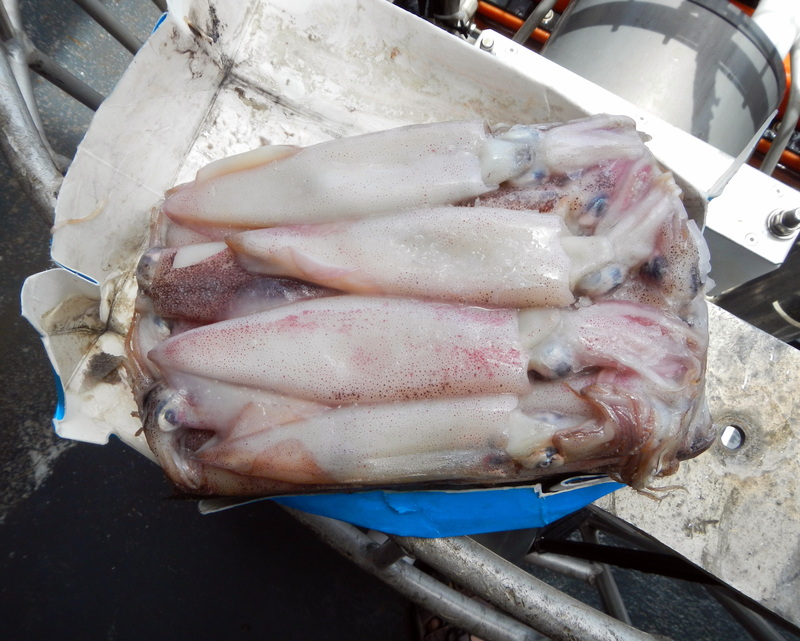 A bag of frozen, cut squid hangs down near the middle. The squid is replaced at every site. Adding bait to the camera array. 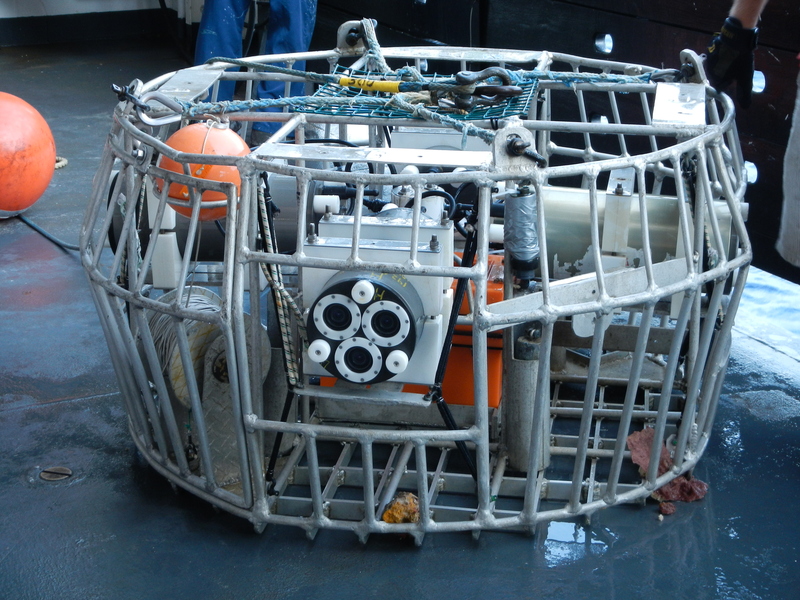 In addition to the bait bag, a Temperature Depth Recorder (TDR) is attached near the center, hanging downward near the bottom third of the array. The purpose of the TDR is to measure the temperature of the water at various depths. It is also used to verify that the depth where the camera comes to rest on the ocean bottom and is roughly equivalent to what the acoustic sounding reports at the site. This is important because the camera generally doesn’t settle directly beneath the ship. Its location is ultimately determined by the drift as it falls through the water column and current. The actual TDR instrument is very small and is attached to the array near the bait bag. After retrieving the array at each site, the TDR is removed from the array and brought inside to download the information. 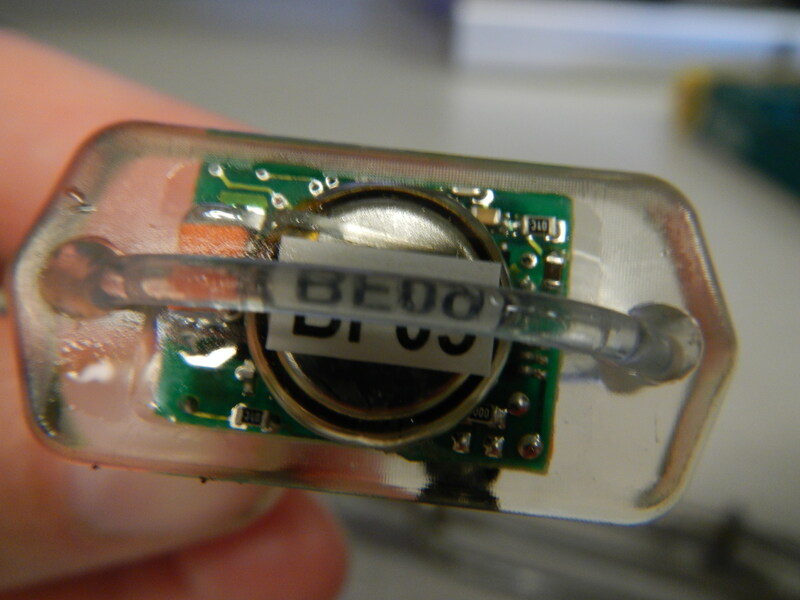 To download, there is a small magnet that is used to tap the instrument (once) and then a stylus attached to the computer is used to read a flash of light emitted by an LED. The magnet is then tapped four times on the instrument to clear the previous run’s data. The data actually records the pressure exerted by the overlying water column in pounds per square inch (psi) which is then converted to a depth. 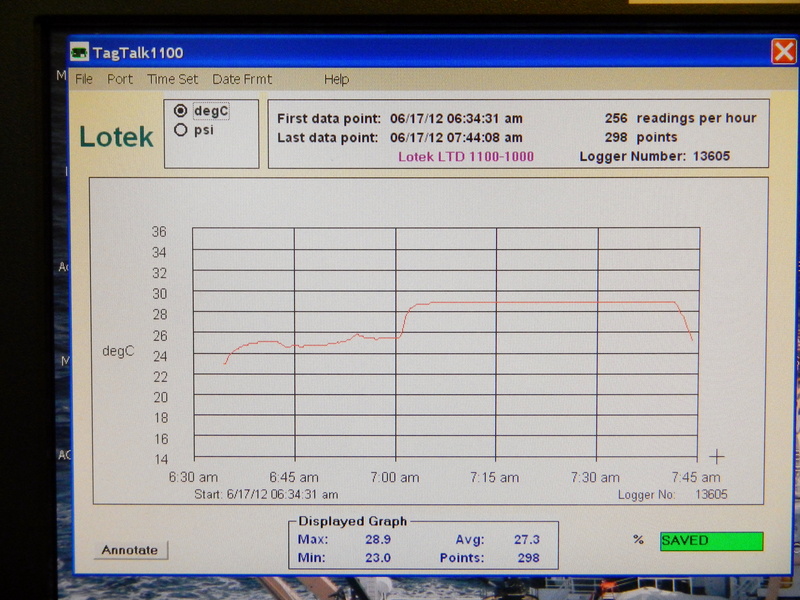 Computer screen showing the data downloaded from the TDR. The video from each day is uploaded to the computer system during the night shift. The following day, Kevin Rademacher (chief scientist), views the videos and quickly annotates the “highlights”. 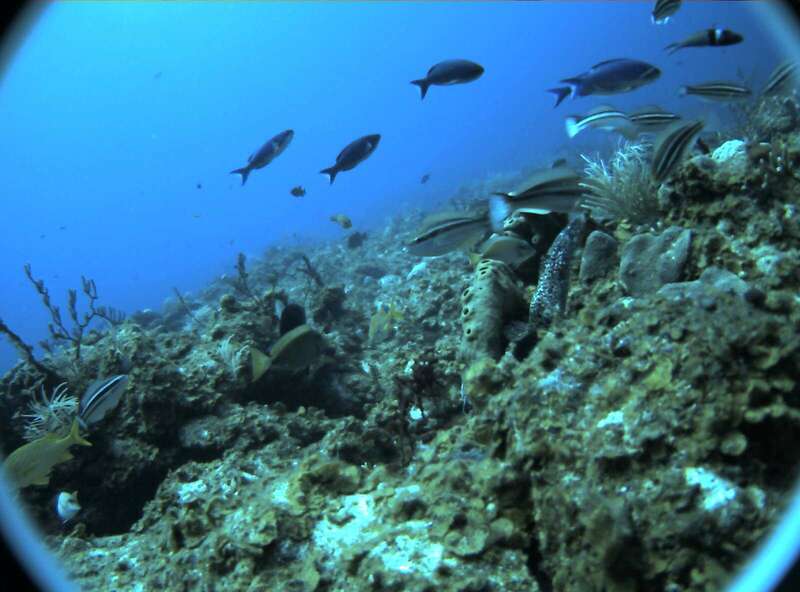 The following things are noted: visual clarity (turbidity [cloudiness due to suspended materials], what the lighting is like [backlit], and possible focusing issues), substrate (what the bottom is made of), commercially viable fish, fish with specific management plans, presence of lionfish (an invasive species), and fish behavior. Of the four cameras, the one with the best available image is noted for later viewing. Once back at the lab, the videos are more completely analyzed. A typical 20-minute video will take anywhere from 30 minutes to three days to complete. This is highly dependent upon density and diversity of fish species seen; the greater the density and diversity, the longer or more viewing events it will take. The experience of the reader is also an important factor. Depending upon the level of expertise, a review system is in place to “back read” or verify species identification. The resulting data is entered into a database which is then used to assign yearly data points for trend analysis. The final database is submitted to the various management councils. From there, management or fisheries rebuilding plans are developed and hopefully, implemented. 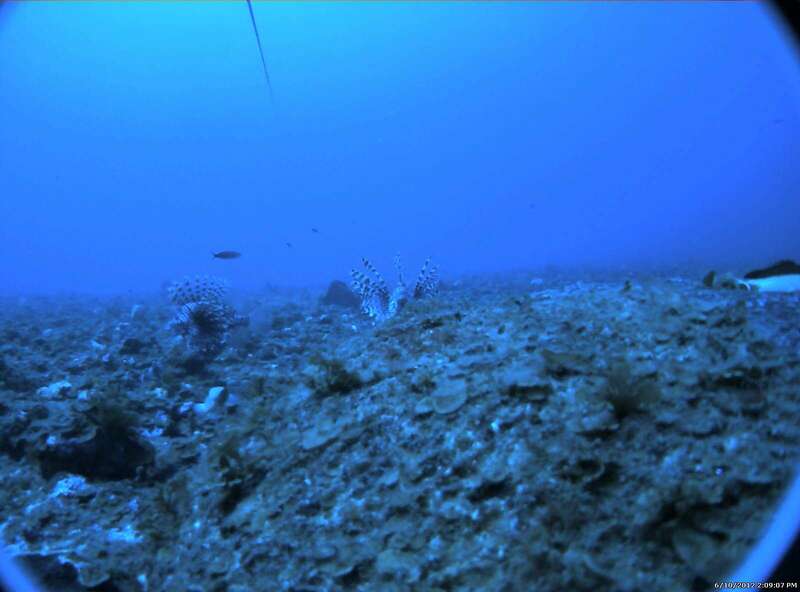 Spotted moray eel viewed from the camera array. He’s well camouflaged; can you find him? Coney with a parasitic isopod attached below its eye. Today, we are off the coast of St. Thomas and St. John in the U.S. Virgin Islands. 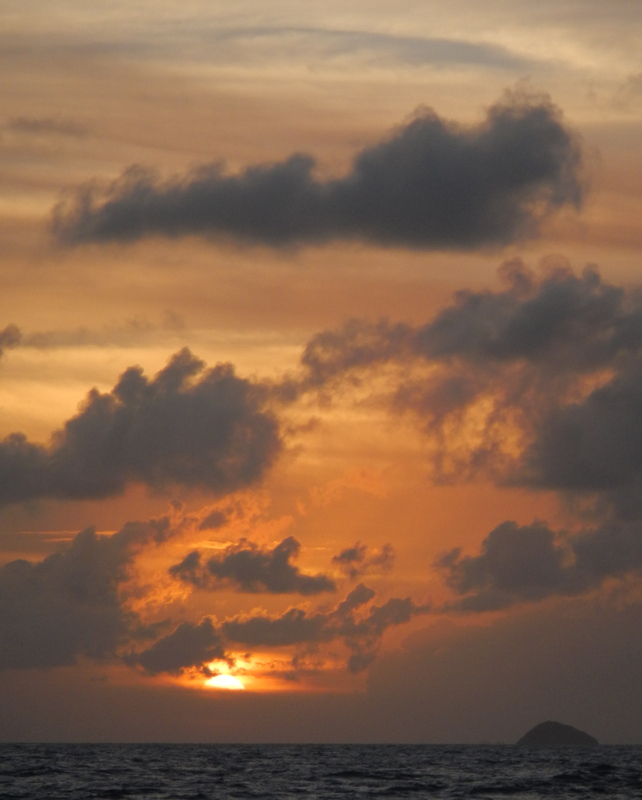 We traveled from the southern coast of St. Croix, went around the western tip of the island and across the straight. When I woke up I could see not only St. Thomas and St. John, but a host of smaller islands located off their coastline. Map of the Virgin Islands. St. Croix and St. Thomas are separated by 35 miles of ocean. It took us about 3 hours to cross to our next set of sampling sites. Around dinner time last night we had an interesting event happen on board. They announced over the radio system that there was a leak in the water line and asked us not to use the heads (toilets). A while later, they announced no unnecessary use of water (showers, etc. ); following that they shut off all water. It didn’t take long for the repairs to occur, and soon the water was returned. However, when I went to dinner, I discovered that the stateroom I’m sharing with Kelly Schill, the Ops Officer, had flooded. Fortunately, the effects of the flooding were not nearly as bad as I had feared. Only a small portion of the room had been affected. The crew did a great job of rapidly assessing the problem and fixing it in a timely manner. After this, I have absolutely no fear about any problems on board because I know the crew will react swiftly, maintain safety, and be professional all the while. Last night was the first sunset I’ve seen since I’ve been on board. Up until this point, it has been too hazy and cloudy. The current haze is caused by dust/sand storms in the Sahara Desert blowing minute particles across the Atlantic Ocean. Today has been a slow day with almost nary a fish caught. We did catch one fish, but by default. It was near the surface and hooked onto our bait. We immediately reeled in the line and extracted it. It was necessary to remove it because it would have skewed our data since it was caught at the surface and not near the reef. This fish was a really exciting one for me to see, because it was a Shark Sucker (Echeneis naucrates). These are the fish you may have seen that hang on to sharks waiting for tasty tidbits to float by. They are always on the lookout for a free meal. One of the most interesting aspects of the shark sucker is that they have a suction device called laminae on top of their heads that looks a little like a grooved Venetian blind system. In order to attach to the shark (or other organism), they “open the blinds” and then close them creating a suction-like connection. The “sucker” structure on the Shark Sucker. Don’t they look like Venetian blinds? 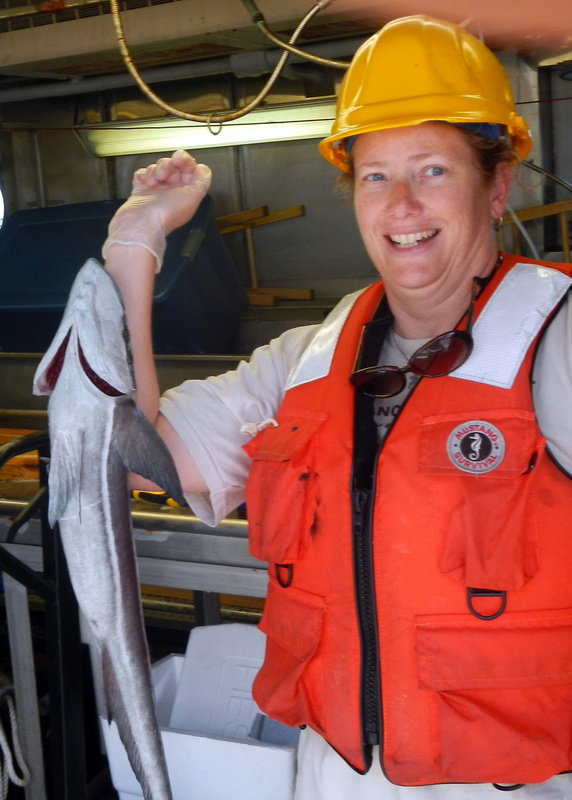 I got to not only see and feel this structure on the fish, but also let it attach itself to my arm! It was the neatest feeling ever! 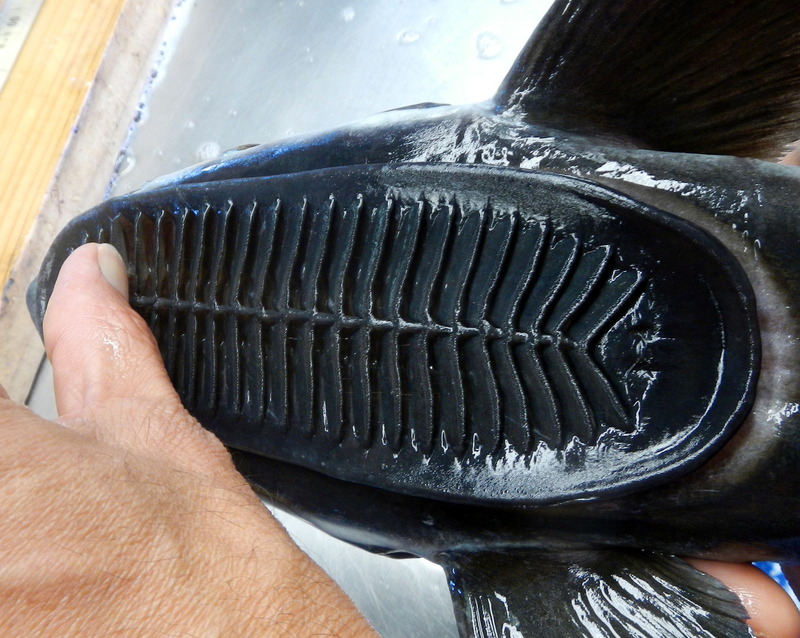 The laminae are actually a modified dorsal spines; these spines are needed because of the roughness of shark’s skin. When the shark sucker detached itself from me, it left a red, slightly irritated mark on my arm that disappeared after a couple of hours. Look, Ma, No Hands! Shark sucker attached to my arm. Tomorrow we’ll be helping place a buoy in between St. Croix and St. Thomas. It will be interesting to see the process and how the anchor is attached. With all the weird and wonderful animals we’re retrieving, I can’t wait to see what another day of fishing brings.